It began with the song that everyone knows. Last night, at their sold-out Knitting Factory show, the trio and their backing band absolutely killed it. Not only in musicianship, but they had the crowd by the ear the entire time and never let go. All generations of punks were in attendance — people who grew up with the Wisconsin-originated band in the 1980s, and also those who discovered them later in the '90s and 2000s. Midway through, concertgoers were slick with sweat and the decision many made to forego deodorant became apparent. The waft of marijuana was there, too. The mosh pit went in waves of wildness. From the stage, frontman Gordon Gano mentioned how glad he was to be back in Spokane to see old family friends and family — his father, Norman Gano, a Baptist minister, retired in Spokane Valley, also his birthplace. (Check out this obituary, which mentions nothing about his son being in a famous band). It’s been about a decade since the band played here last, and the energy radiating from the stage showed just how much they actually wanted to be in Spokane, playing for these people. Now, let’s talk instruments. It is the best thing to watch a super-talented bass player in action, especially on the rarely used acoustic bass. So often, the instrument is delegated to the worst guitarist in the band, but with Brain Ritchie, it was one of the stars of the show with his virtuosic spiderfinger-playing on full display. Gano played guitar, banjo and also fiddle, which he’s improved on immensely since I saw him at Sasquatch! two years ago. And the new drummer John Sparrow fit right into place, utilizing an actual cooking grill with his drum kit. The subcontrabass sax is so tall you can't even see the top of it. 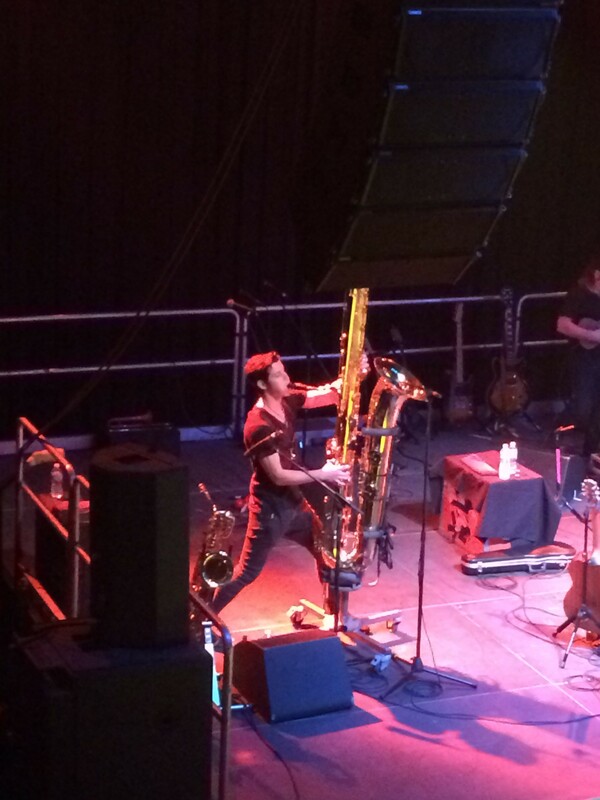 I’d never seen a subcontrabass saxophone in person before, but last night we got to see Blaise Garza blow hard into one. Other instruments included: an actual box, xylophone (duh! ), mandolin and cabasa. It was an all out spectacle. As for the songs, most of the hits were there (“Gone Daddy Gone,” "Kiss Off," “Black Girls”) but some of the new songs were peppered in for good measure and they worked well. 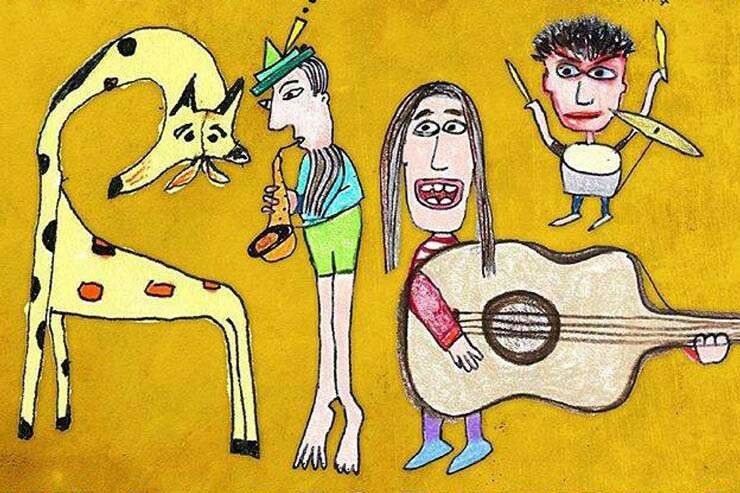 This is a band whose music never sounds dated. It has loads of country and punk and even some big band influences stuffed into one glorious package. Gano’s voice is still as mighty and biting as it ever was. The rendition of “Country Death Song,” a diddy about a man murdering his daughter and then killing himself, was especially memorable. The audience cheered loudly for the lyric “I'm going out to the barn to hang myself in shame” — it was that kind of show. At the end of the set they launched into the amazing “American Music,” full of meaty solos, and then promptly left the stage. Thankfully, there was an encore. They played a sweet rendition of the ballad “What You Really Need,” written by Gano’s sister Cynthia. But the crowd grew restless. Finally, in the end, Gano sang out a cappella “Day after day / I will walk and I will play.” And we all knew what was coming. To the sweet melodies of “Add it Up,” the packed-out house grew even more sweaty and smelly and no one wanted any of it to end. This is what it looks like when a show is absolutely the most fun. Hopefully, they can come back soon. InHealth: Should you be scared of spuds?